A few months ago, if you walked by a vacant State Street storefront, you’d most likely see a “for lease” sign in the window and cobwebs in the corners. Today, however, things are a bit different. Most of those buildings are still vacant, but now, advertisements urging people to keep walking, to a restaurant that is open, sit in the windows. 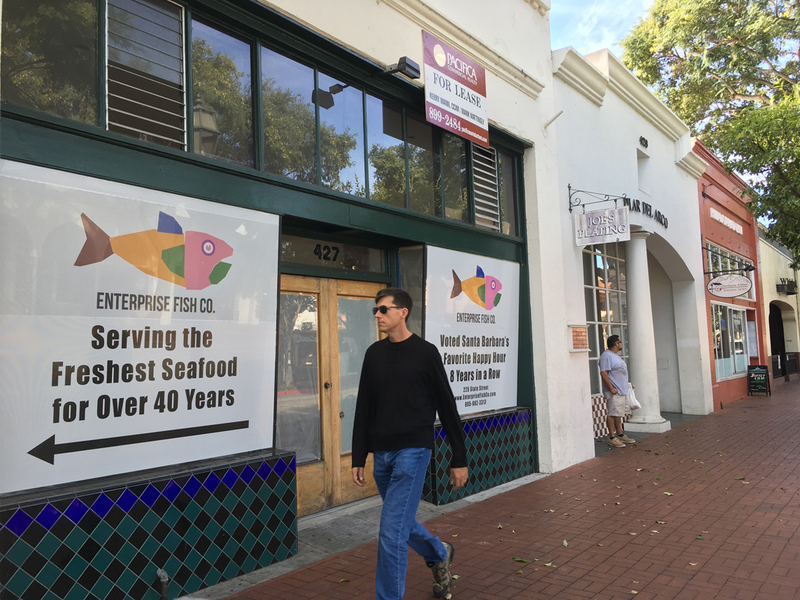 While the fix is aesthetic, it’s part of Santa Barbara’s efforts to overhaul State Street, and help businesses find success at a time when the economics of downtown are under siege. Amazon is diverting business from the malls and retailers that were once king of city. A perceived rise in homeless people and chronic panhandlers plague downtown. It’s tough to walk a block without encountering someone living on the streets or panhandling for money. Those factors, coupled with the high cost of commercial rents in the downtown core and the success of Santa Barbara's Funk Zone, have contributed to an overall demise of downtown. Santa Barbara city leaders, public private and private, are working hard to turn the tide and revive the area. The problem didn’t happen overnight and it won’t get fixed that fast either. While business owners and political candidates have complained that strict permitting regulations stall the pace of downtown, the city believes it’s half-full, half-empty scenario. “Santa Barbara does have a lot of regulations, but it is also what makes it such a unique and exciting place to live and have a business,” said Paul Casey, Santa Barbara’s City Administrator. The city over the summer created an Accelerated Pilot Permit Program to help business owners obtain business permits speedier than in the past. The pilot program covers a six-month period and runs along State Street between Cabrillo Boulevard and Sola Street. There is a dedicated city phone line to answer questions about State Street-area commercial tenant space, and planning staff members guide business owners and commercial real estate brokers through the discretionary review processes. Projects will also receive priority placement on design review board agendas. Aron Ashland, managing partner of the SandBar restaurant on the 500 block of State Street, said the ACCELERATE State Street program helped him open his business quickly after a fire in August forced hit to shut down. “I have to say it worked out really well,” Ashland said. Casey said the Accelerate program helps fill vacant storefronts quickly. The city has also redesigned its website, pulling together regulations and different services for business needs all in one area. “This information helps businesses understand when they need to contact the city and gives other tips and advice like what questions to ask before you sign a lease,” Casey said. Ken Oplinger, president and CEO of the Chamber of the Santa Barbara Region, said Santa Barbara is not business friendly. “It’s not an organized, ‘we’re going to stick it to businesses,’ type of unfriendly,” Oplinger said. “It’s more of an over-regulation that stymies business, and a lack of a ‘we’re here to help’ policy during the permitting process. “There are some signs that the latter is changing as there are absolutely some people within city government who want to help, and with the implementation of the Accelerate Program on State Street we’ve seen a bit of a move to assist, but the pendulum still has a ways to go to move back to even a middle ground,” he said. Oplinger also said the city could do more. It could expand the accelerate program to other parts of the city. “Our new City Council should make it a goal to stop talking about the problem, and start doing something about it,” Oplinger said. “Perhaps it’s time for a regulatory summit in Santa Barbara with a goal of bringing the community together to find ways to maintain Santa Barbara’s historic beauty while making it easier to develop in-fill projects that meet certain community goals, housing, commercial business, etc.,” Oplinger said. Casey said the city plays an important role in revitalizing State Street, but it can’t do it all. Casey also said the city is open to a diverse mix of uses on State Street, in partnership with the private sector. “A strong mix of office and residential uses, primarily on the upper stories, in and around downtown to support ground level retail and restaurant businesses, would seem to be a good compliment to the ground-level experience and downtown as a whole,” Casey said.